While the albatross has achieved fame through literature—perhaps most notably as a majestic and tragic character in Samuel Taylor Coleridge’s “Rime of the Ancient Mariner”—the species has been a veritable mystery to scientists throughout much of human history. Capable of covering incredible distances and living mostly at sea, albatross tracking and study present obvious challenges. The following is an excerpt from Eye of the Albatross. Bioneers is thrilled to welcome Carl Safina to the 2017 Bioneers conference where he’ll speak about how humans can learn from the natural world. The breeze in my bedroom is the first sign that this morning is different. After prior days of dead calm, newly moving air has passed its kinetic energy along to the heat-stressed birds. You can feel their excitement in their increased activity. Patty is doing the day’s first round of her nest checks, looking for any mates of transmittered albatrosses that may have arrived and switched incubation duties. We walk among the incubating birds like grape growers among vineyards. So far all the incubating birds in the study area are the same; Amelia and the others. No new arrivals. But one premature departure, probably forced by the just-ended heat-wave; its abandoned egg now cool to the touch. Patty, several yards ahead, suddenly calls and waves. Has one of the transmittered adults departed? No. But when we walk up, Patty gestures to a Black-footed Albatross standing over an eggshell with a gaping hole at one end and a downy chick beside it. Karen arrives eagerly, and immediately volunteers to guard the chick as we give its parent a transmitter. Her job right now—a tough job if ever there was one—is protecting this chick from possible frigatebird attack and the sun. Karen is concerned the chick is too exposed. “It’s not used to being out in the sun,” she says. I offer her my hat to shade it, but she’s transfixed. That, it is. But with luck and all odds vanquished, this unsteady little new life may go forward—and outlive us. A Laysan Albatross walks by like a pedestrian, pausing to stare at the chick like an admiring passerby. A nearby nester stands up, looks at its own egg, and starts talking to it. As hatching nears, parents commonly vocalize to their upcoming offspring. And as soon as a chick holes or “pips” the egg, it begins talking back. As Dr. Seuss might summarize: Horton finally hears a Who. Parent and child keep the conversation going through the hole in the eggshell during the many hours it takes for the chick inside to painstakingly chisel out. By our fourth day, ten albatrosses wear transmitters. Now, oddly, the field work is largely done, and most of the data accrual will happen almost passively as technology takes over, reporting the birds’ positions. (So far the data are less than interesting, because none of the birds has moved.) Now, we ourselves will also wait faithfully like Horton the Elephant, attached by effort and scientific curiosity to the patiently sitting birds. Each day we check. Each day, the faithful birds at their nests remain. Patty is excited. Halfway through a new day’s morning nest check, she’s just discovered the mate of one of our birds sitting on the nest. The transmitter-bearing bird is gone! Dave comes riding up slowly on his bicycle. Even though it arrived just last night from weeks at sea, the new bird sits here as though nothing is unusual. Amelia and her neighbors, sitting as always, appear equally indifferent. But Patty is stoked. “Now,” Patty says, “we’ll be getting some data.” Somewhere between the vast Pacific and outer space, albatross, satellites, and Dave’s North Carolina laboratory are already corresponding. Each day the satellites will interrogate the transmitter, and the bird’s location will be beamed to Earth. Amelia couldn’t care less; she’s still here on her nest near the porch, still broody and dozing. Patty and Dave set up a laptop computer on a picnic table on the barracks’ back porch, and using a solar panel to power it, they link to a communications satellite to download e-mail. With noddies lined up on the porch rail and the computer set up near the laundry lines, information flows into the laptop from outer space. The transmitter data has already been beamed via another satellite to a facility in France, then sent from France to Dave’s North Carolina lab, and a student has e-mailed it. Result: we discover that our outbound bird is sixty miles north of Tern Island. During the night of January 17-18 another transmittered albatross has left Tern Island. But the albatross I call Amelia resides, remains, and rests upon her nest next to the porch steps. We pause. She waits. We watch. She stands, talks in low tones to her egg, flares her brood patch and sits back down. For now, that has to count as action. By the following day, two more of the birds are outbound over the ocean. Things are happening. Patty and Dave are departing too, headed home. Patty will leave her birds and begin the hard work of her Master’s project in earnest from thousands of miles away. Getting here has been neither likely nor easy for any of us, biologist or bird. The planning, the traveling, the personal and professional toil, the resolute routes and sheer luck that have led us here—the convergence is quite an improbable one. All of us differ in every detail. All have one thing in common: whether seeking to succeed or striving to breed, we’ve arrived here as survivors of earlier struggles. Hoping our efforts will meet continued luck, we now stand poised for payoff, ready to see our labors produce. I say our time has shot by. Dave looks at his watch to remind himself what month it is. Waving, waving, waving, they are gone. They leave over the ocean, like everything else. When Amelia stands for her next nest-check, her egg is gone. Between her massive webbed feet sits a gray ball of spiky fluff. 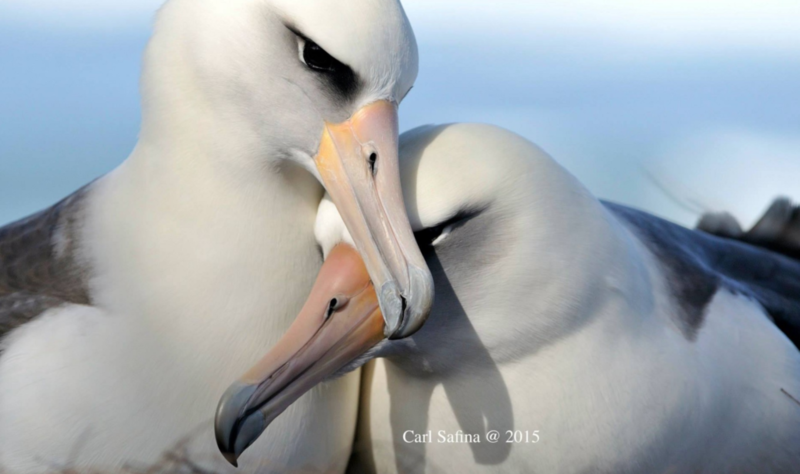 By this time, the sixth of February, many of the other albatross nests already harbor chicks. Amelia broods her baby three days, providing shade and shelter from heat and high winds. When her mate arrives to relieve her in the early morning of February 9, Dad immediately feeds the little chick. Or tries to. He crouches so far forward toward the chicklet that his breast is touching the nest’s low rim. The hungry chick is eager, pecking shakily at its parent’s bill, peeping a shrill call that sounds like, “Me, me, me.” Dad is trying so hard to begin regurgitating that the effort seems to force his wings partly open. At the same time, he is trying to make contact with the chick’s little bill, but the uncoordinated hatchling keeps swinging away at the critical moment. Eventually, with the kind of persistence that precedes all earned rewards, the male practically swallows the chick’s head. In the cavern of its father’s gape, the chick opens its wobbly little bill. Dad squirts a concentrated stream of gooey, nutritious, liquefied oil into the chick’s throat. Unlike most other birds, albatrosses and their tube-nosed relatives store oil extracted from their food. Albatross stomach oil is so energy rich its mean caloric value rates just below that of commercial diesel oil. After wiping its beak, the chick half-stands and waves it’s little wings, then sits back down contentedly. For the moment, all’s right with the world. And so a new phase kicks in. Amelia and her mate must now no longer simply share incubation shifts; the chick’s arrival begins a period of increasing strain in an already strenuous life. Bodily reserves will be taxed to the max. Now, food is the issue. But in practice almost all albatrosses almost everywhere eat mostly squid. It’s even been suggested that albatross evolution and radiation around the world has corresponded to squid evolution as the birds became skilled squid finders. Squids are highly evolved, unusually successful predators in their own right. The Cretaceous mass extinction wiped away not only dinosaurs but also many kinds of marine life that had flourished for an enormity of time. As disappearance of dinosaurs opened the land to opportunities for birds and mammals, extinction of marine faunas opened the seas to the radiation and proliferation of modern-style fishes and squids, with new monarchies of predators. The rapidly spreading new jet-propulsion-bodied animals we know as squids evolved complex behavior, excellent eyesight, and surprising smarts (they have been called “the soft intelligence” and “honorary vertebrates”). Squids have proliferated into over 700 species moving throughout the world’s seas, from sunlit reefs to the black abyss, from the size of your little finger to the Giant Squid measuring almost sixty feet. Enter albatrosses. Albatrosses eat about 70 species of squid. At times the birds catch them live and vigorous. But they also exploit the fact that many kinds of squid die en masse after spawning. About a day after dying in the chilly deep, the carcasses of many species of squid float to the surface, buoyed by increasing ammonia resulting from chemical changes in their livers. Albatrosses rely heavily on this phenomenon to make deep food available. In the western Tasman Sea off New South Wales, Australia, a spectacular post-nuptial appearance of dead and dying 10-pound Giant Cuttlefish prompts a remarkable convergence of albatrosses. Birds from half a world away—from the South Atlantic, Indian Ocean, and New Zealand—find it worth their while each year to come for the funeral feast. In sum: Albatrosses eat a lot of squid. People also eat a lot of squid, and fishing boats remove enormous quantities of food albatrosses have for millennia relied on. In much of the world, squid fishing is done at night, using bright lights to attract squid to the boat as moths are attracted to porch lights. So great is the fishing pressure now that the lights of squid fishing fleets are visible to astronauts in space, appearing like cities in the sea. With Dad now nest-bound, it’s Amelia’s turn to face the vicissitudes of the ocean, but she’s an experienced pro. So far, she has survived all trials of weather, threats of starvation, and hazards of humanity. She launches herself from the runway and strikes immediately northward. Amelia sails past the island’s shore, skims across the lagoon, and rises above the towering breakers beyond the reef, setting her course upon an open ocean, striking out into the wide trance of the sea. Belly to the sideways breeze, catching the wind for levitation, she climbs. Then turning her back to that same breeze, she uses the wind differently—and adds gravity—to accelerate her forward and downward toward the surface of the ocean. She brushes the water and shifts her body again, transferring the downward momentum to help lift her; exploiting the force of gravity to take her upward. Having used the wind to take her up, she uses it to take her down; having used gravity to take her down, she uses it to take her up. This gives her a smoothly undulating, rocking flight; each wing alternately pointing skyward, then pointing toward the water’s surface, showing you now her dark back, now her bright belly. Wings fixed, she seems magically propelled. Only as you watch her nearing the vanishing point—only then—do you begin seeing and feeling that these birds muster all their distance-eating achievement with their own effort and the skillful exploitation of their exquisite design. Keep watching as she shrinks to a pinpoint, swooping up and down, swiveling side to side, bounding onward into the boundless Pacific. Just this way, she starts steadily accumulating the great span of a great ocean, mile after mile after mile. 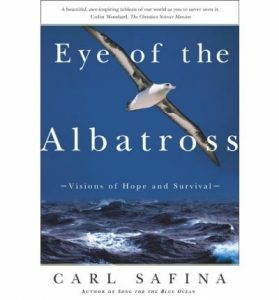 This excerpt has been reprinted with permission from Eye of the Albatross by Carl Safina, published by Holt Paperbacks, 2003. Read an excerpt from another Carl Safina book, Beyond Words: What Animals Think and Feel.